This copy of the Four Gospels has notes on the final flyleaves relating to S. Augustine's abbey, Canterbury, and the main scribe has been identified as the scribe of a number of other Canterbury books, which makes it almost certain that this manuscript was written there. 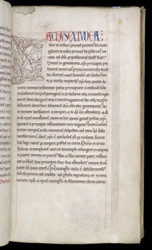 St. Michael the archangel is usually depicted in medieval art trampling on a dragon, and preparing to kill it with spear or sword; here the scene inhabits an initial 'M'. It is possible that the artist had previously illustrated a text beginning with 'M' for Michael, and reused the image here, where the 'M' stands for Matthew.